Daniel and Karen using the blueberries they picked to make a blueberry french toast bake with cream cheese for breakfast. 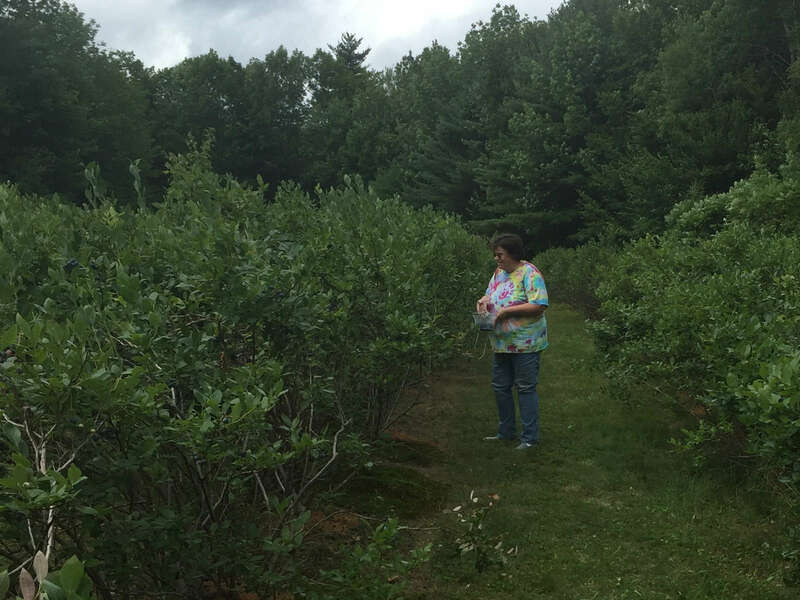 Karen picking blueberries at a pick-your-own farm in Sanbornville. 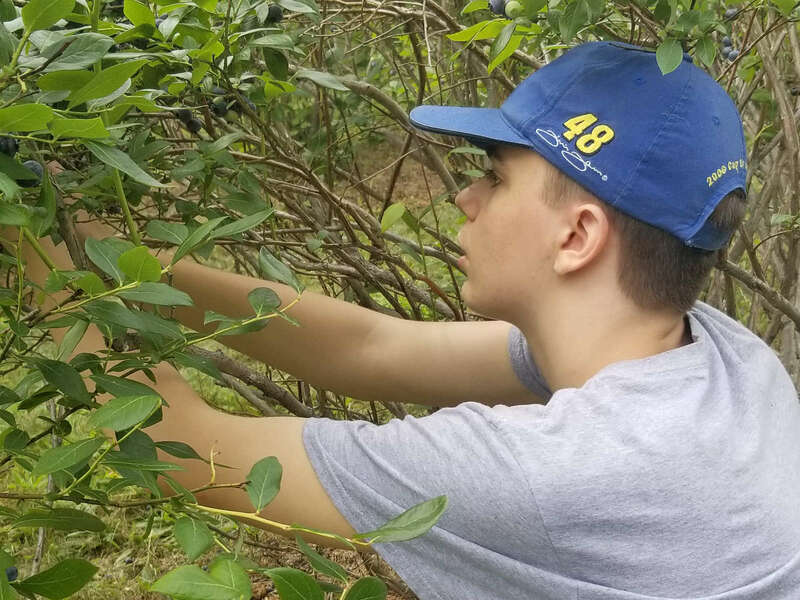 Daniel picks blueberries at a pick-your-own farm in Sanbornville. 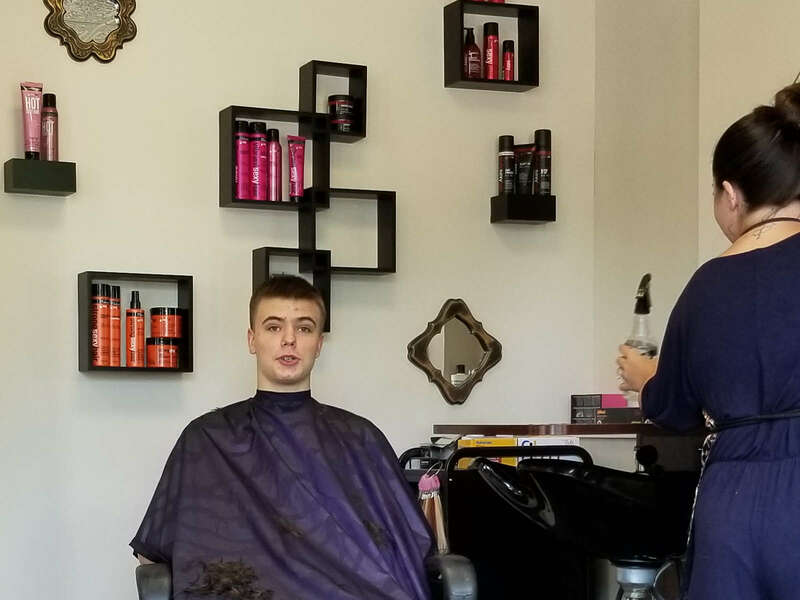 Daniel getting his summer haircut, a little late in the season. 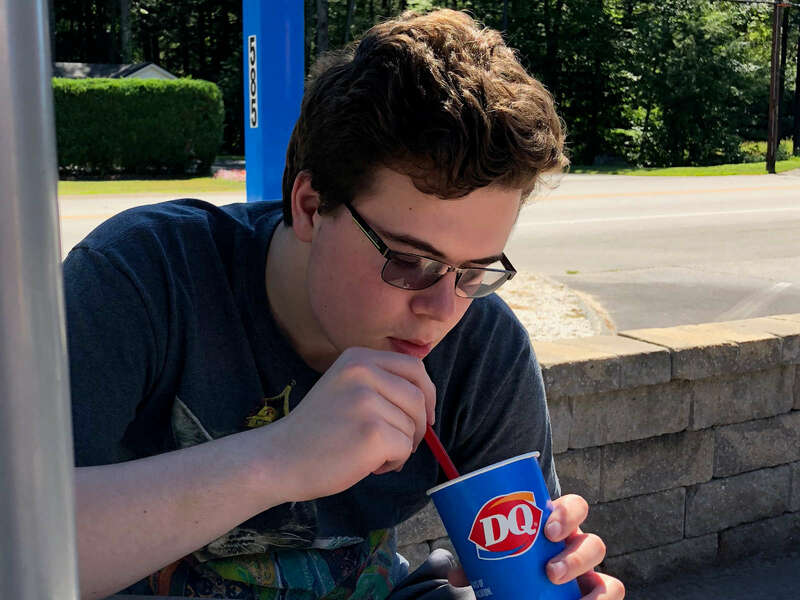 William enjoys a treat at Dairy Queen during a break from driving practice. He put in more than two hours in one day. 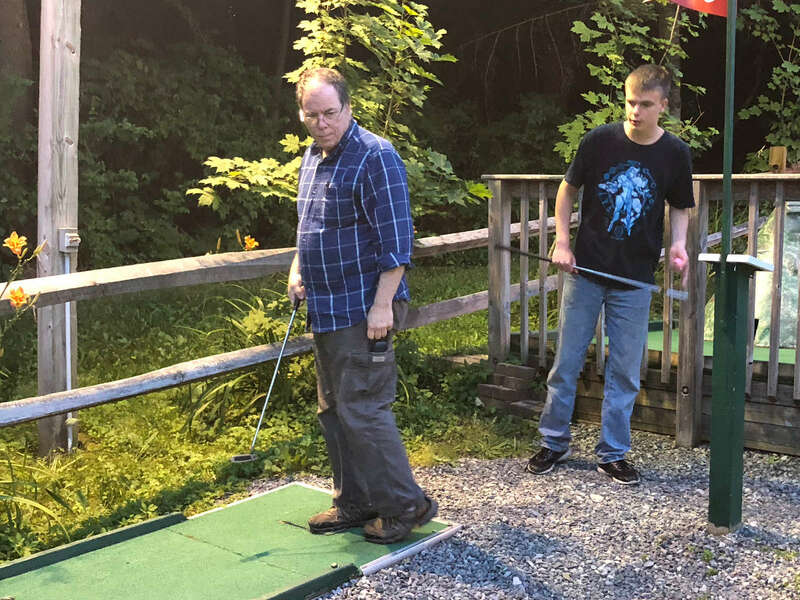 Gordon joins Daniel and Karen for a round of miniature golf on one of the rare evenings that everyone (except William) had off during the summer. 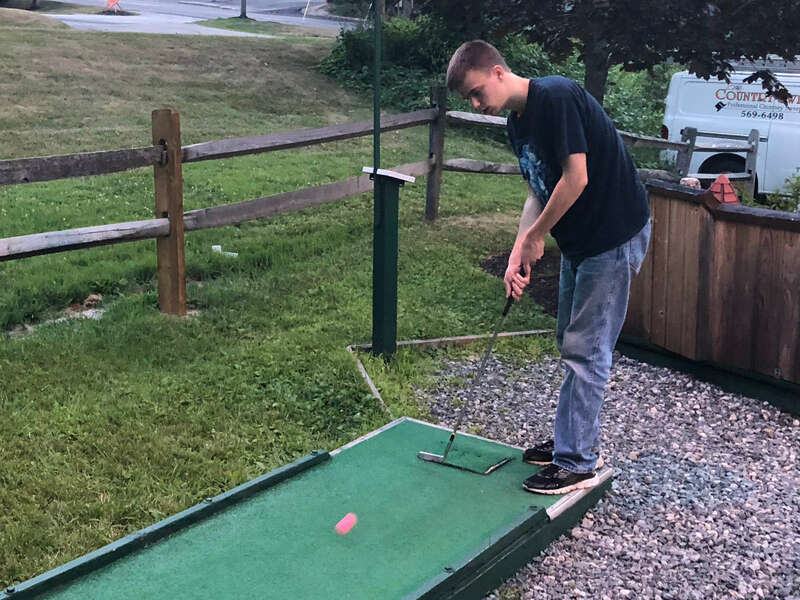 Daniel takes his shot on one of the holes at our local miniature golf course, in the middle of town. 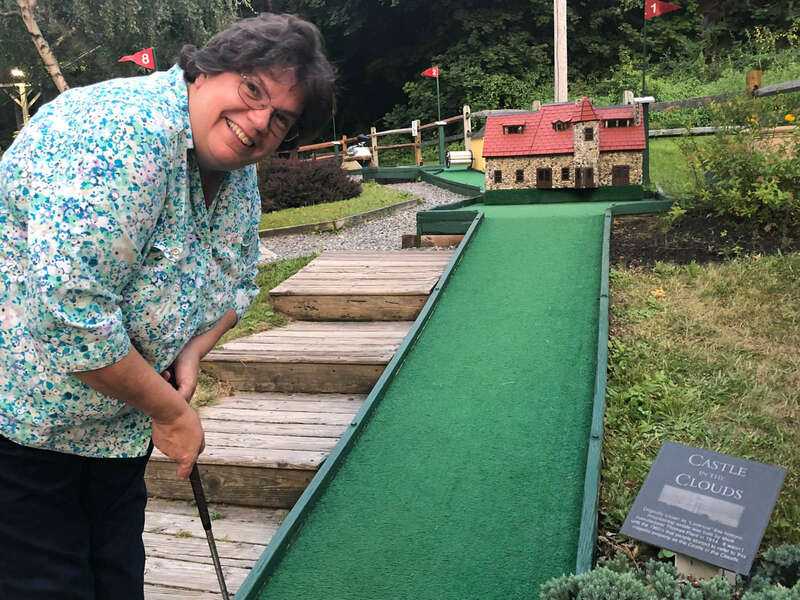 Karen tees off on a round of miniature golf in front of a model of one of our favorite New Hampshire landmarks, the Castle in the Clouds. 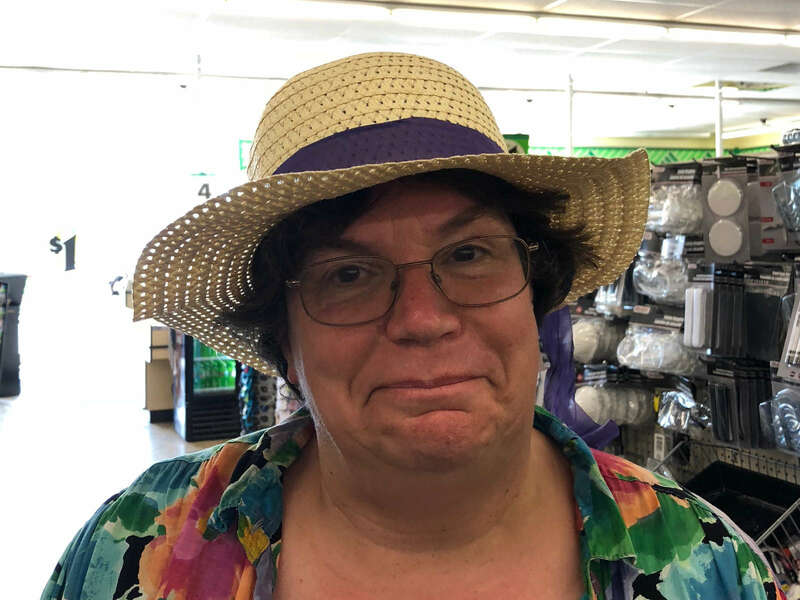 Karen absolutely had to buy this hat for two reasons: first, it was only a buck, and second, her husband told her how cute it looked on her. 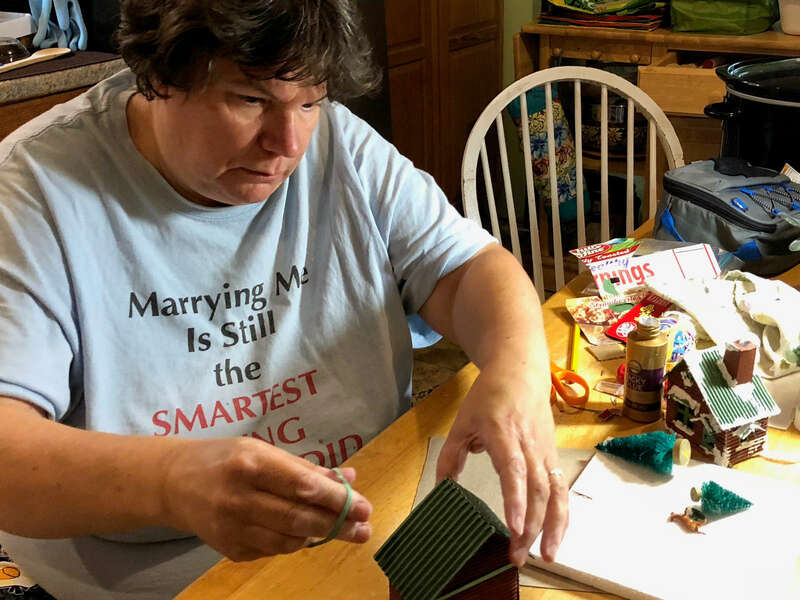 Karen makes a glitter house with a non-holiday theme as a birthday gift for a friend. 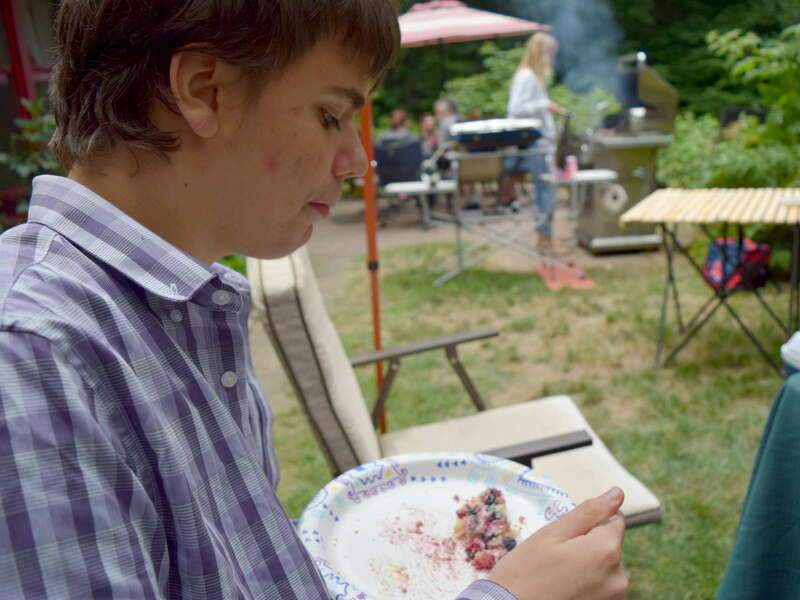 Danny enjoys one of the delicious desserts brought to the birthday celebration of a family friend. 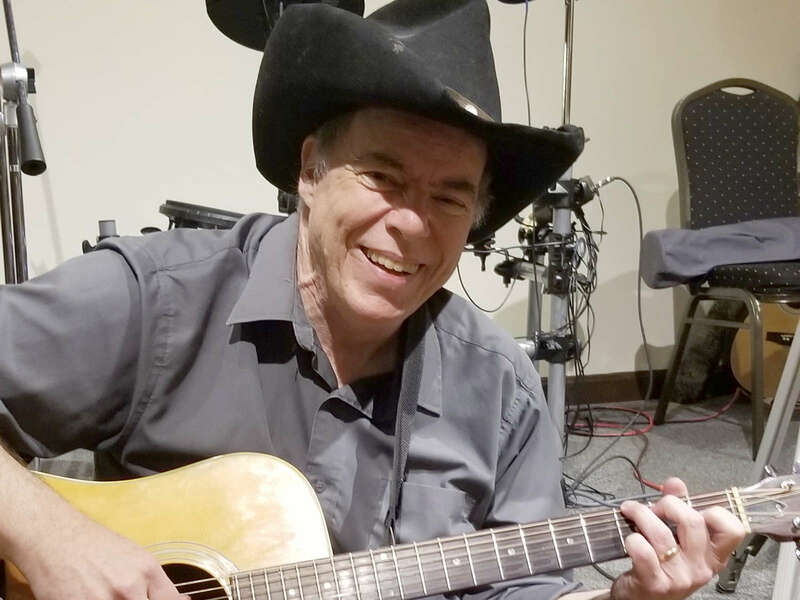 Gordon sings a couple of sets of music selected especially for his beautiful wife during their 30th Anniversary Party. 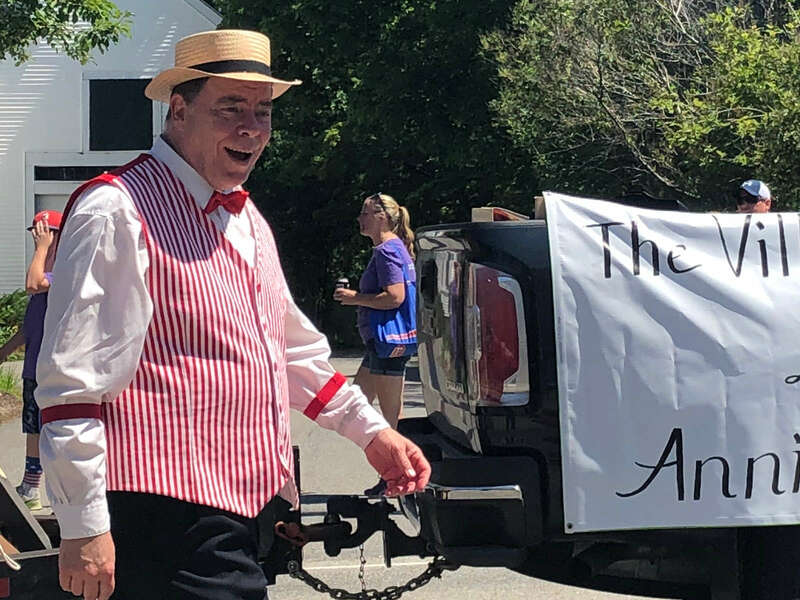 Gordon marches in the 4th of July parade with The Village Players, in the costume he wore when he was part of the barbershop quartet in "The Music Man" last fall. 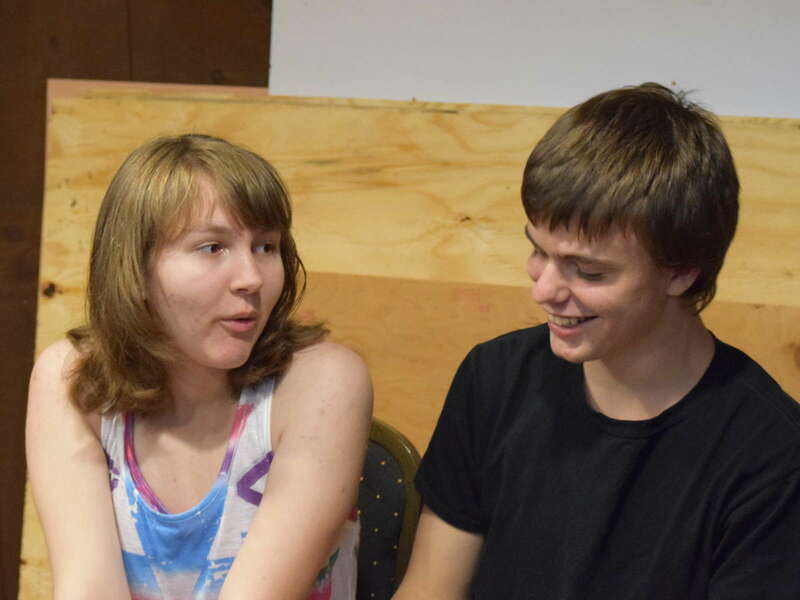 Danny enjoys a few moments with his friend Adele in the bar pit at the resort where Danny had been serving ice cream during the party. 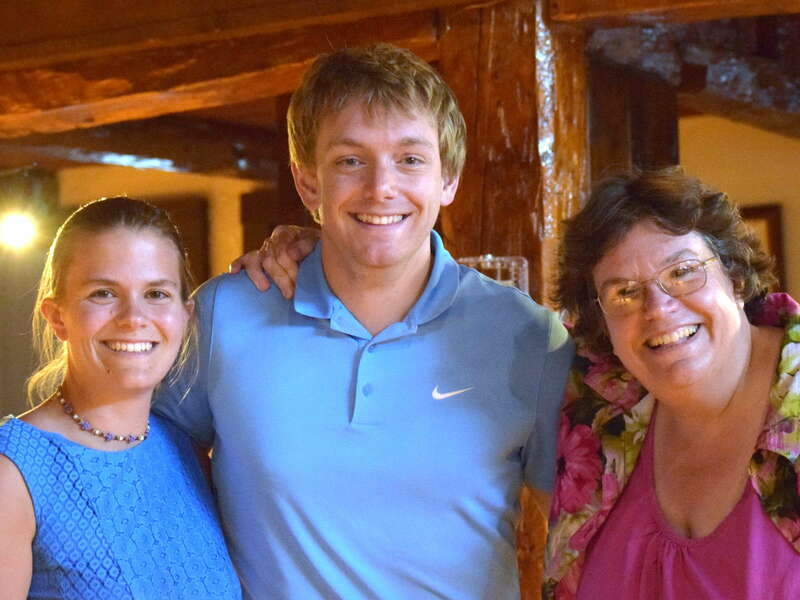 Our niece Katherine and her husband-to-be Mike with Karen at our 30th Anniversary Party. 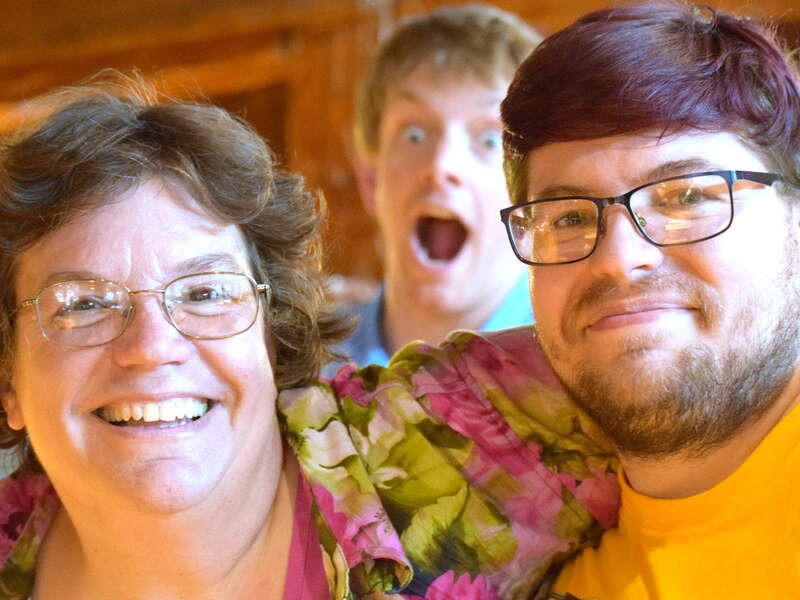 Karen and Thomas get photobombed by Katherine's fiance Mike at Karen and Gordon's 30th Anniversary Party. 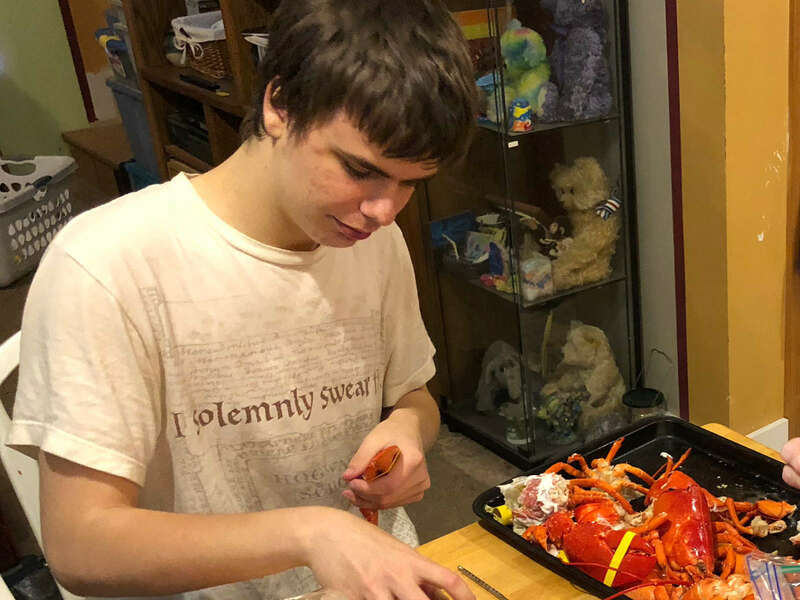 Danny helps shell some lobsters generously provided (and already cooked!) by one of Gordon's customers. We shared our site with a another member of our group who could only stay the second night. 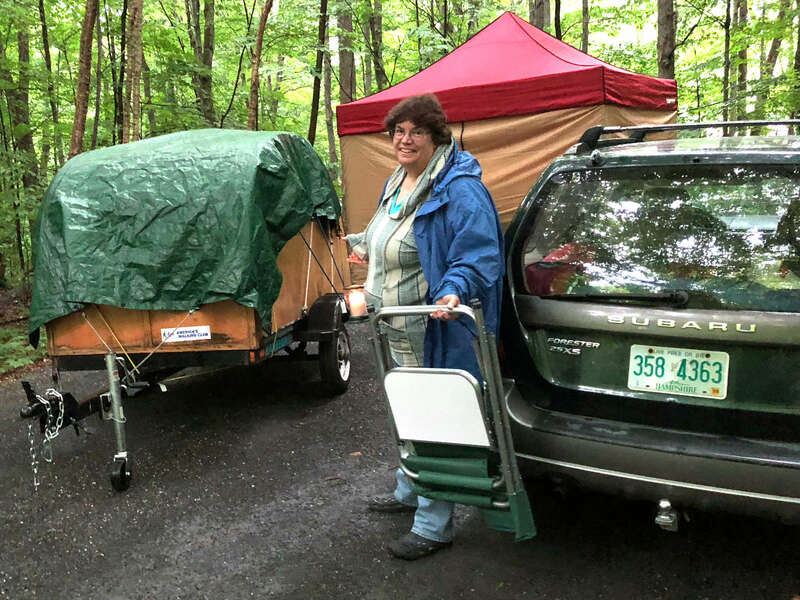 We were amazed when we arrived to see how much her trailer looks like ours! 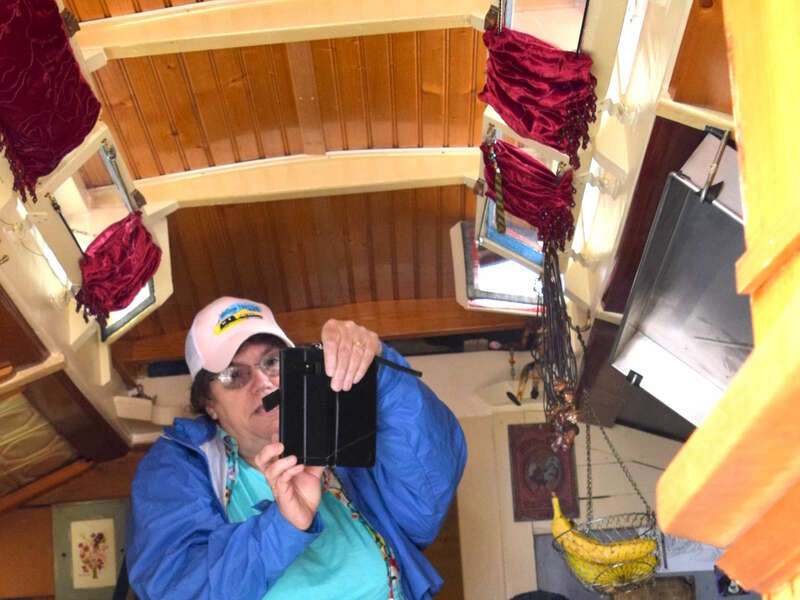 Karen takes pictures inside a gypsy wagon built onto the bed of a truck. 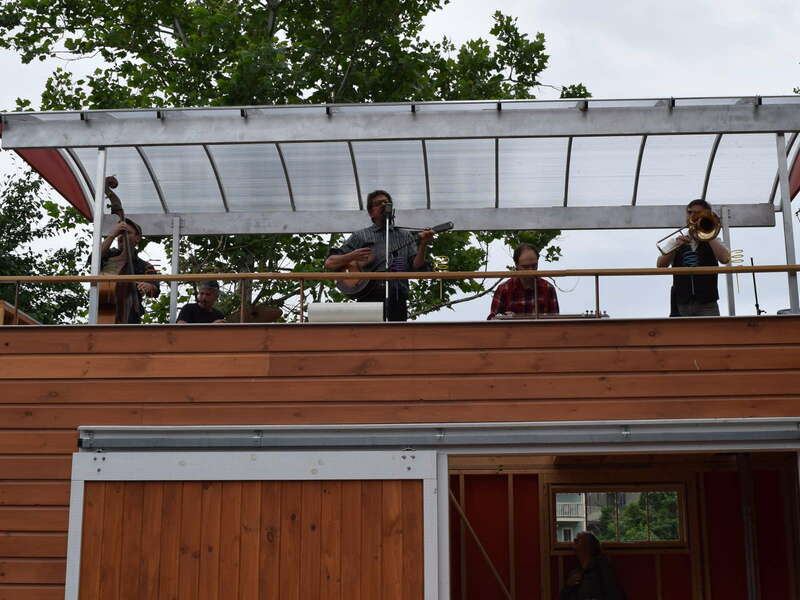 Even the bandstand for this jazz ensemble was a tiny house made especially for travelling bands. 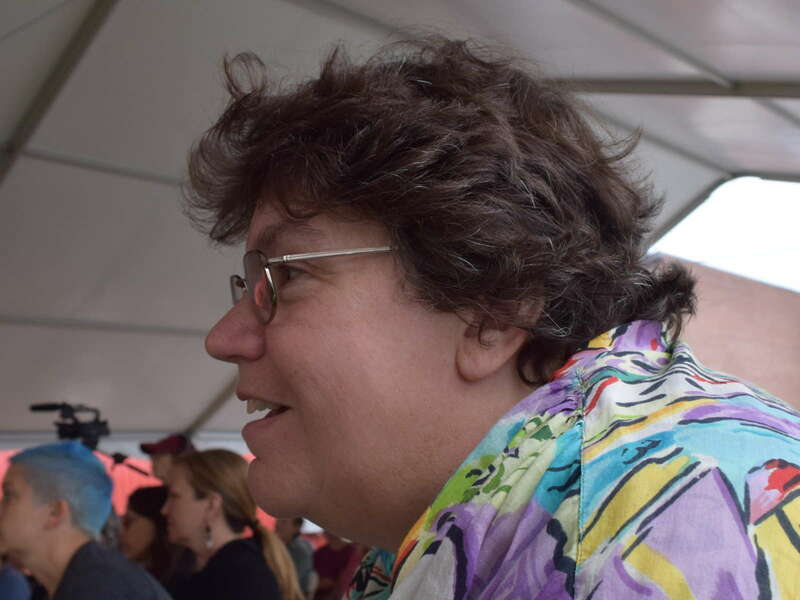 Karen enjoys a lecture at the Vermont Tiny House Festival in Brattleboro. 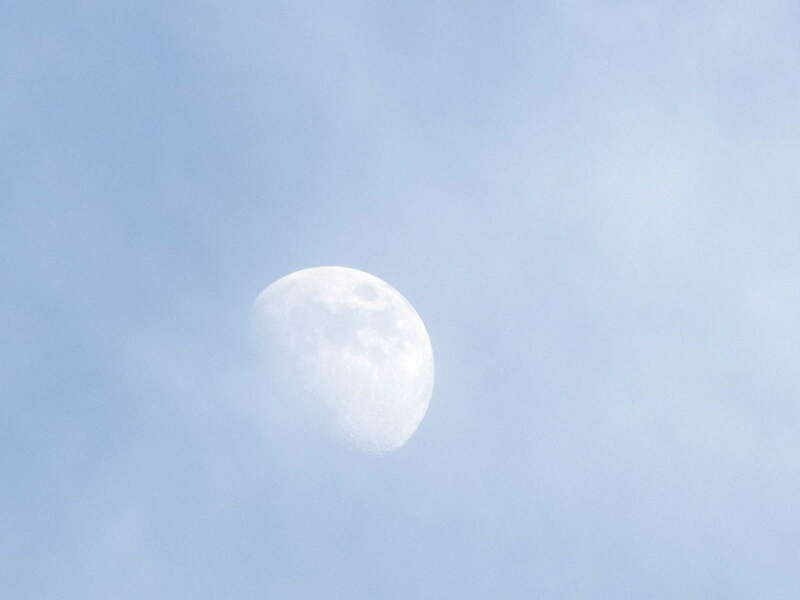 When we stopped for coffee on the way to the tiny house even, Gordon grabbed this lovely picture of the moon. 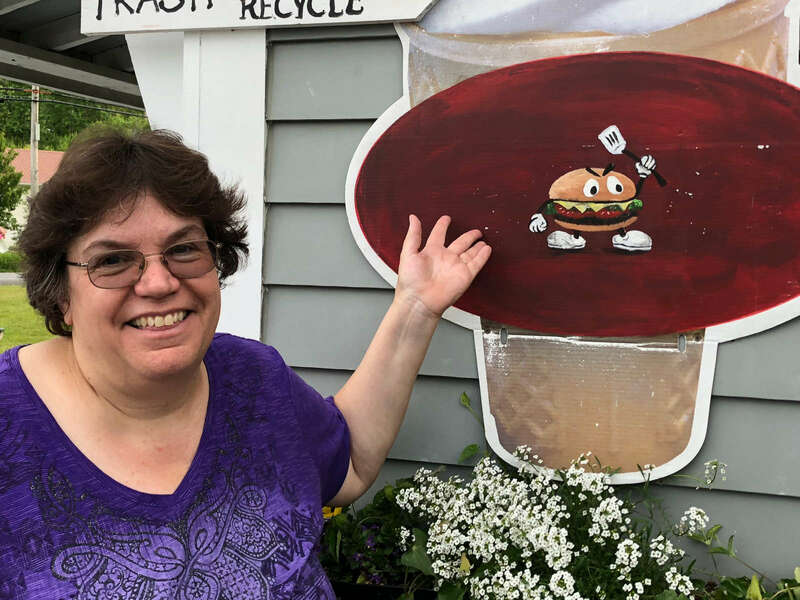 Karen loved this logo for Woo Hoo burger and ice cream stand, near our campsite in Wilmington, Vermont. 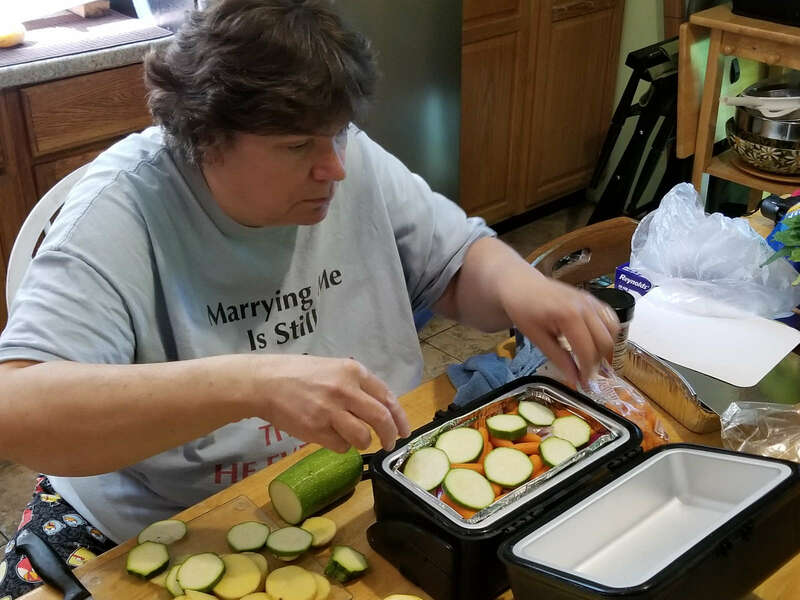 Karen prepares a meal of chicken, potatoes, carrots, onions, and zucchini for cooking in our new Road Pro 12V cooker. The results were delicious! 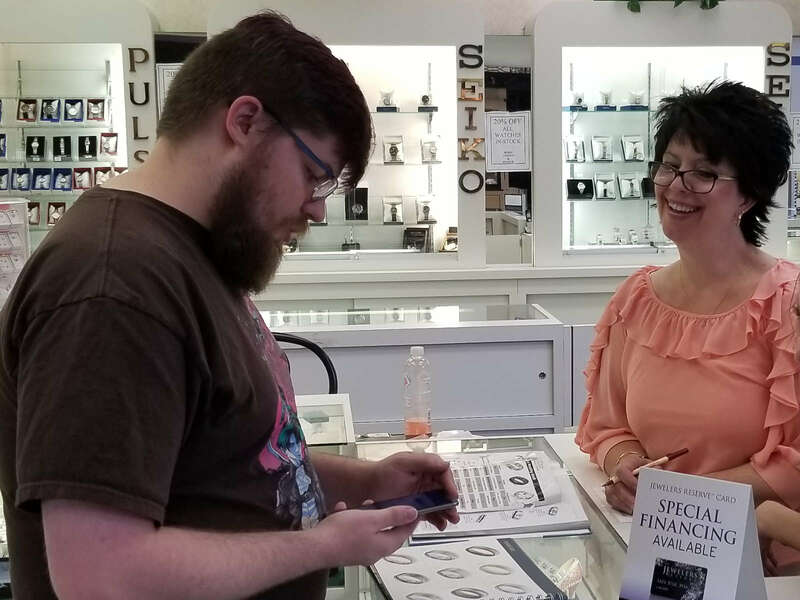 Thomas doing a little shopping at a jewelry store. Hmm. 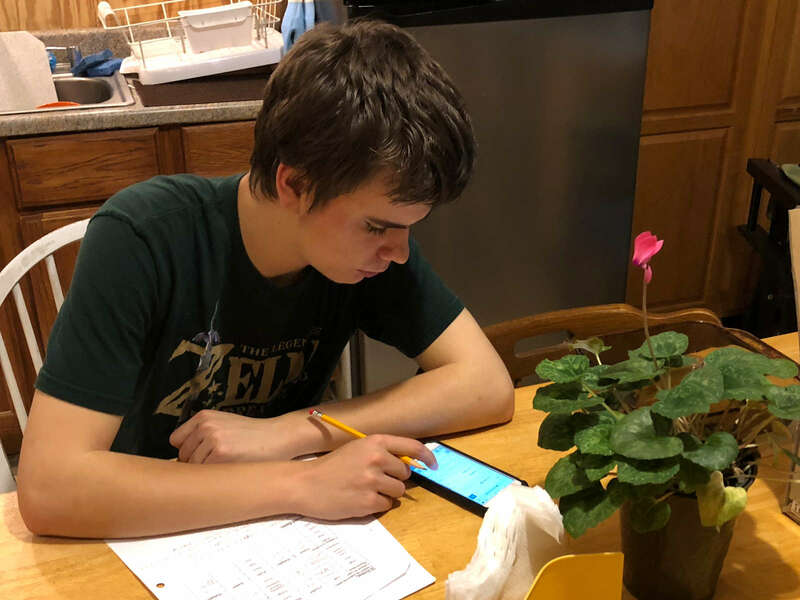 Danny studies for a Physical Science final, using his phone for research. 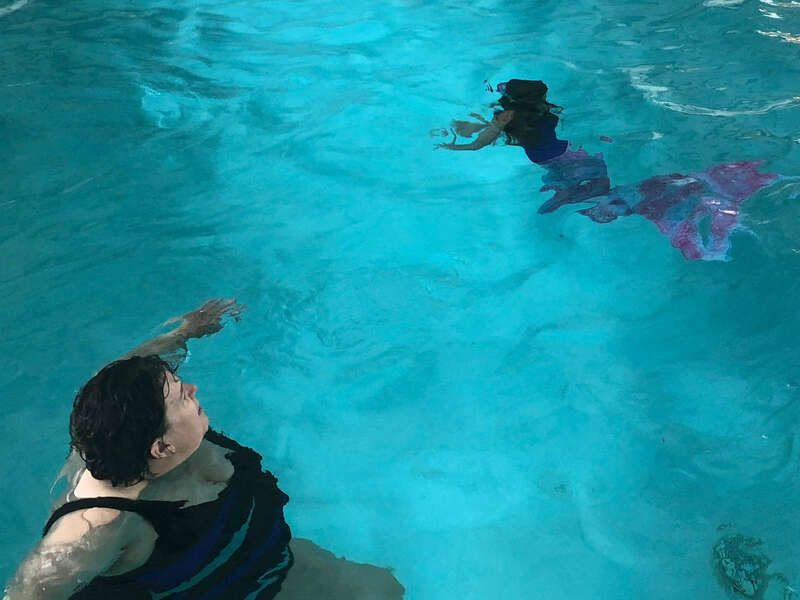 Karen meets a mermaid in the pool. The young girl had a mermaid costume with a working flipper tail. 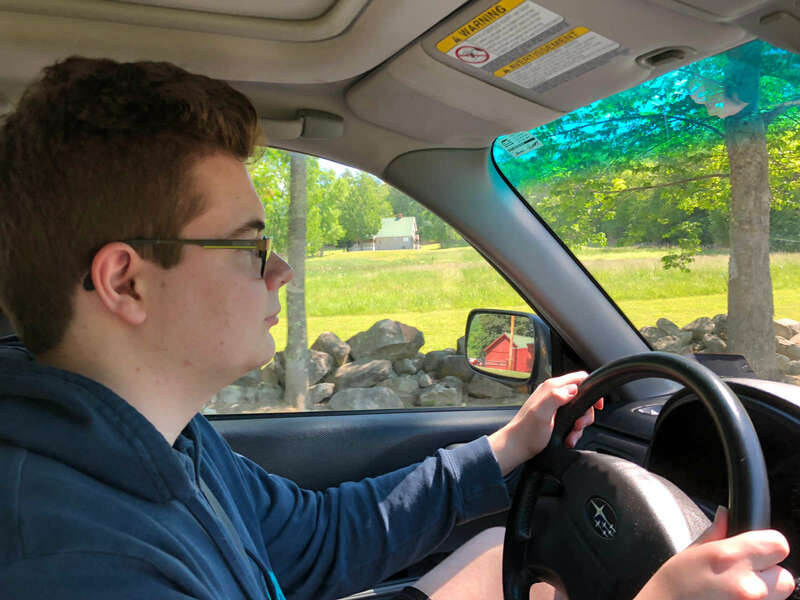 William out for a little afterschool driving practice, in his own car this time. 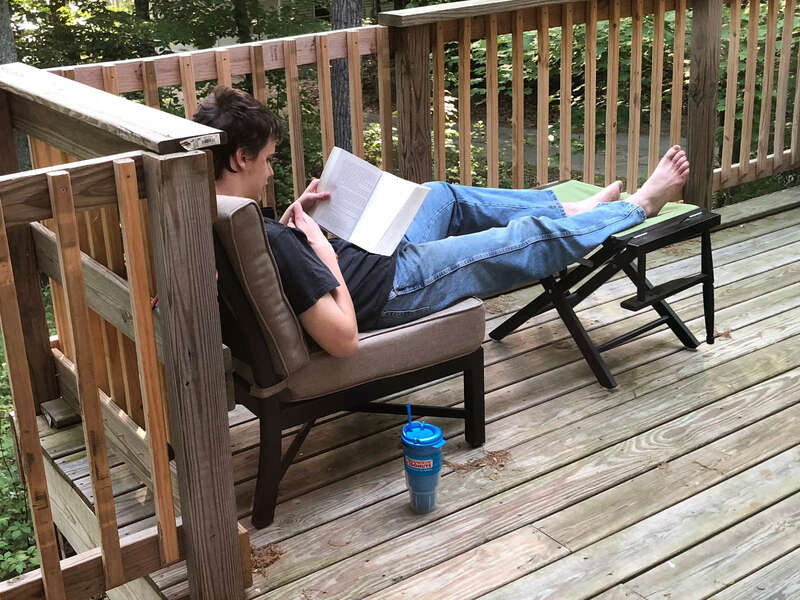 Danny's perfect Spring afternoon: sunshine, a good book, and a cup of iced coffee. 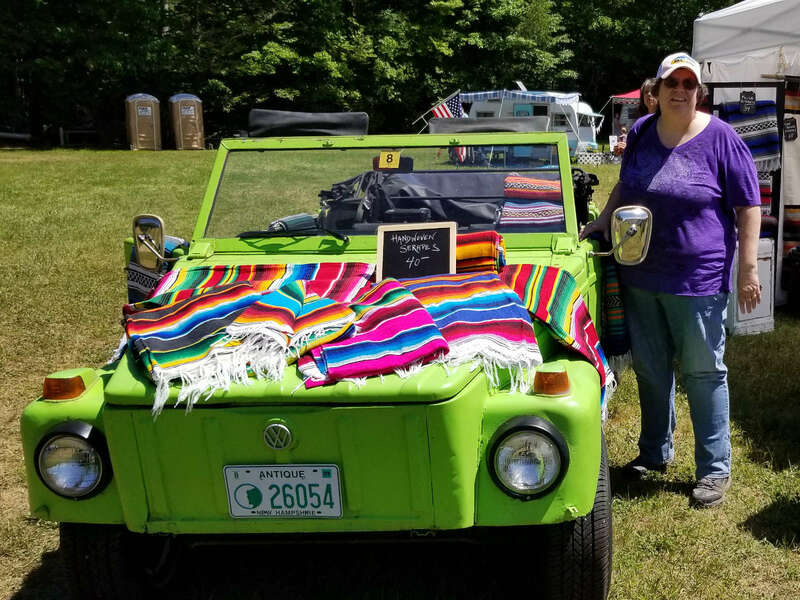 Karen posing with a Volkswagen Thing, which brought back some 70s memories. She also bought one of those gorgeous blankets. 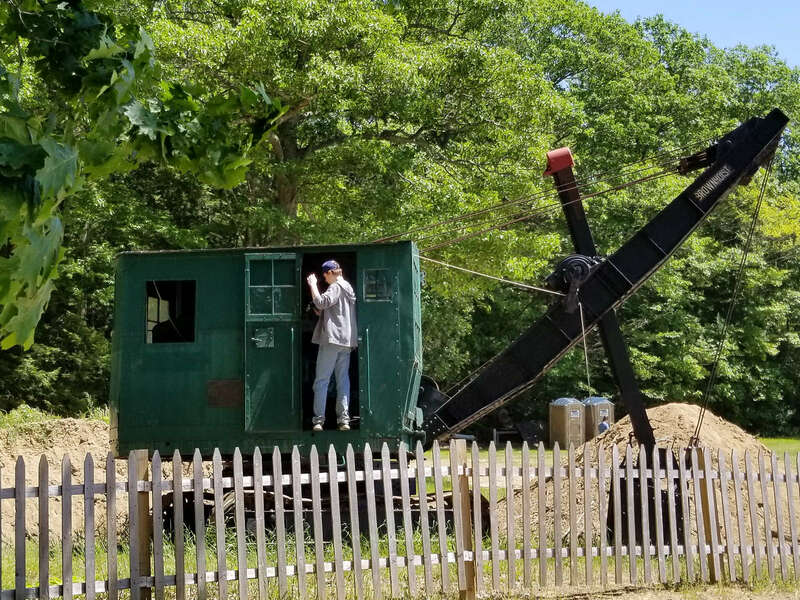 Danny exploring an old steam shovel at the Vintage Fair. 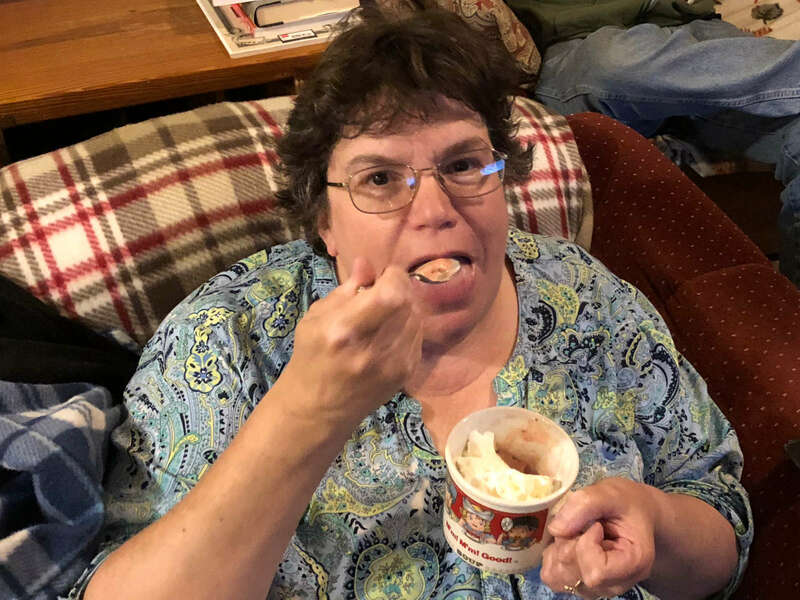 It reminded Karen of the character Mary Ann from "Mike Mulligan and His Steam Shovel." 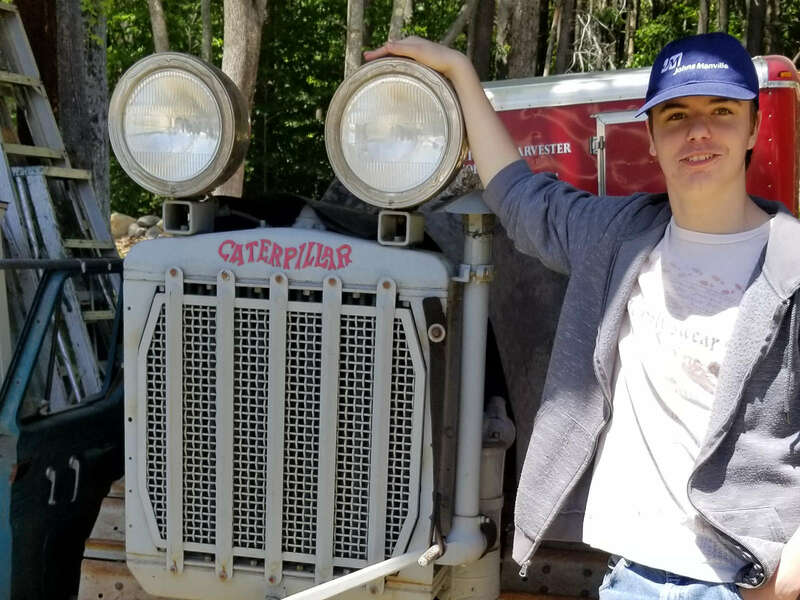 Danny found this vintage Caterpillar tractor at the Vintage Fair. 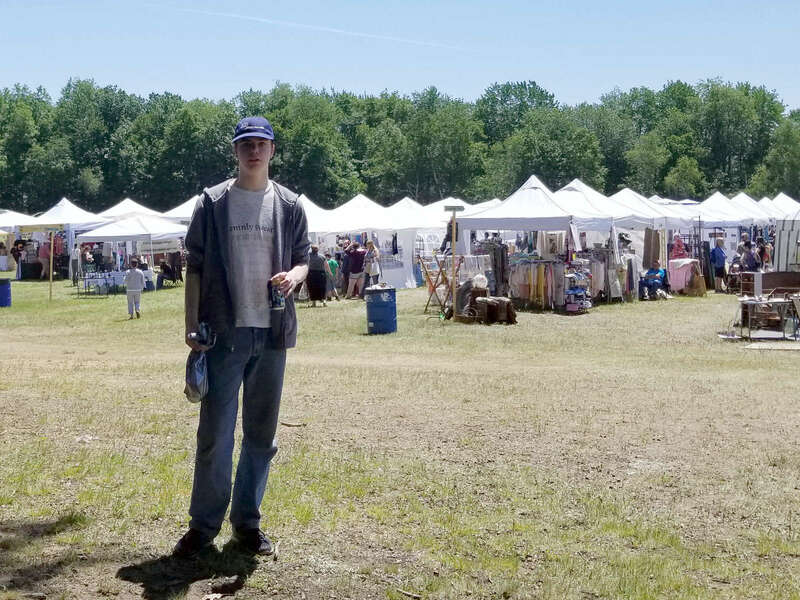 Danny at a Vintage Fair he went to with Karen in Dublin, New Hampshire. 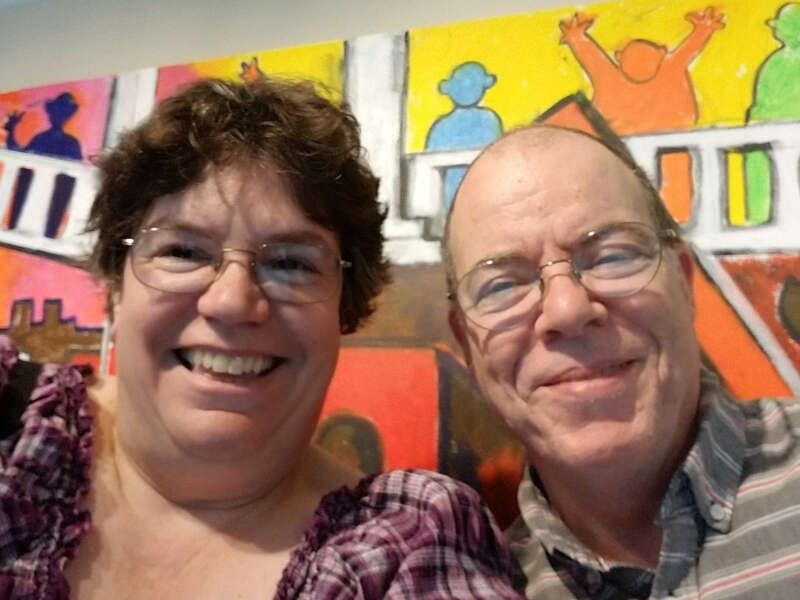 Karen and Gordon in front of the community art mural in the basement of the Currier Art Museum in Manchester. 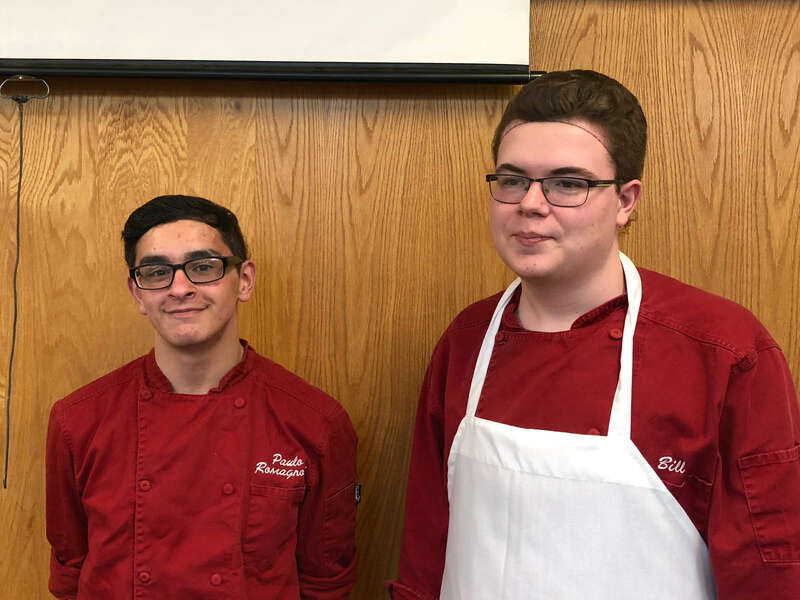 William and his friend Paulo serve the last buffet of the season at the restaurant run by the school's Culinary Arts program. 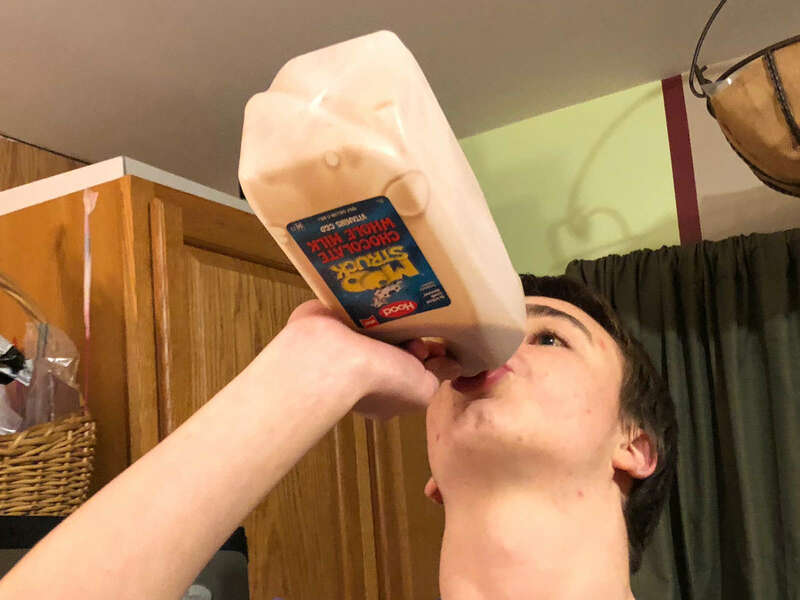 Daniel chugs the last of a half gallon of chocolate milk that he and Karen bought as a special treat to share between Danny and Gordon. No one else in the house is a fan. 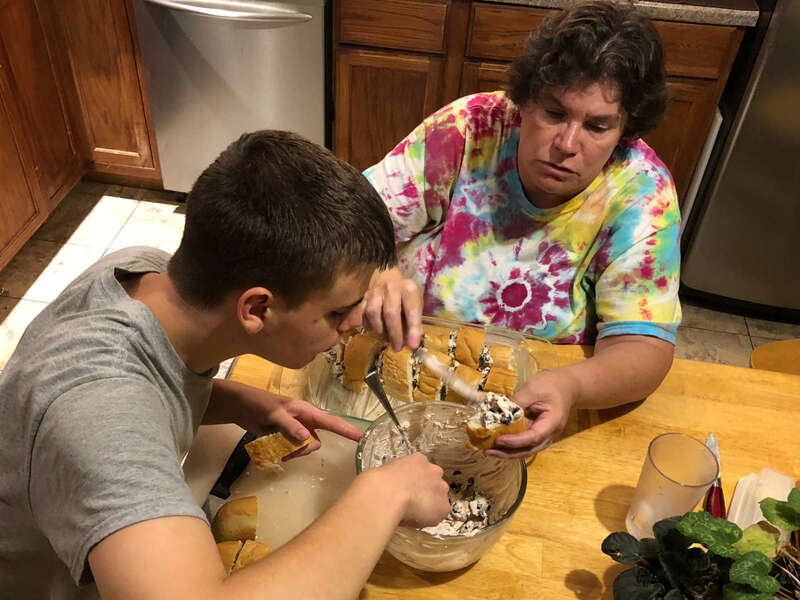 Karen tries a dessert we made at home. The only ingredients are frozen bananas, frozen strawberries, and a touch of vanilla. Topped with whipped cream, of course. 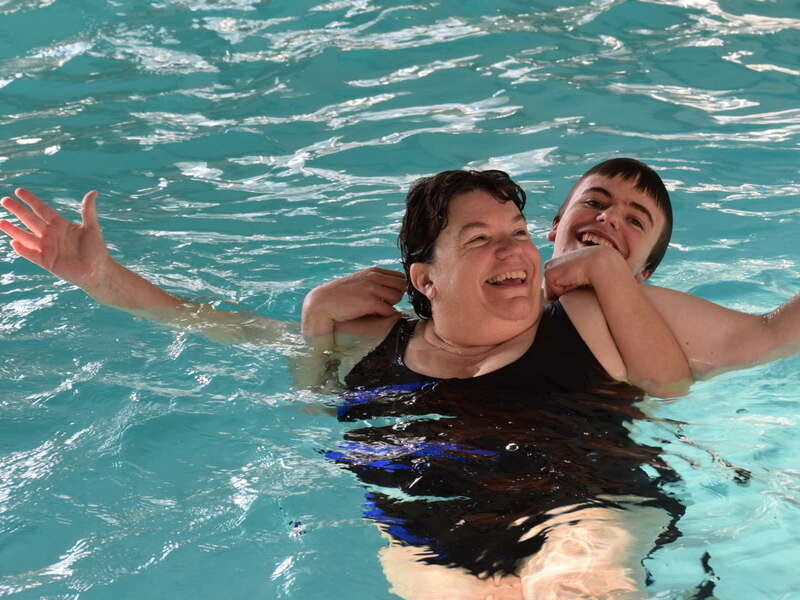 Karen and Danny play around in the pool at the Windrifter. Not quite the season for swimming in the lake yet. Karen tests the clam chowder she and Gordon made for a camp potluck. 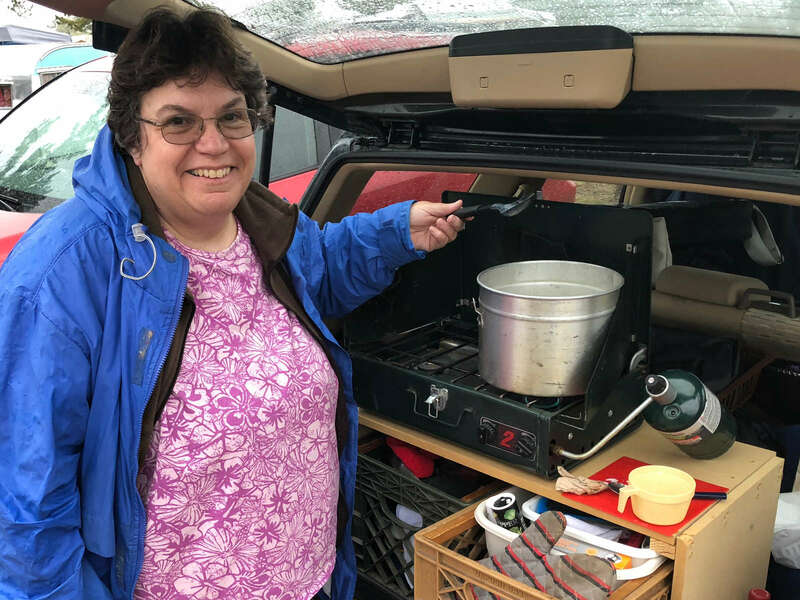 Karen rigged the cooking gear so that we can cook from the back of the car. 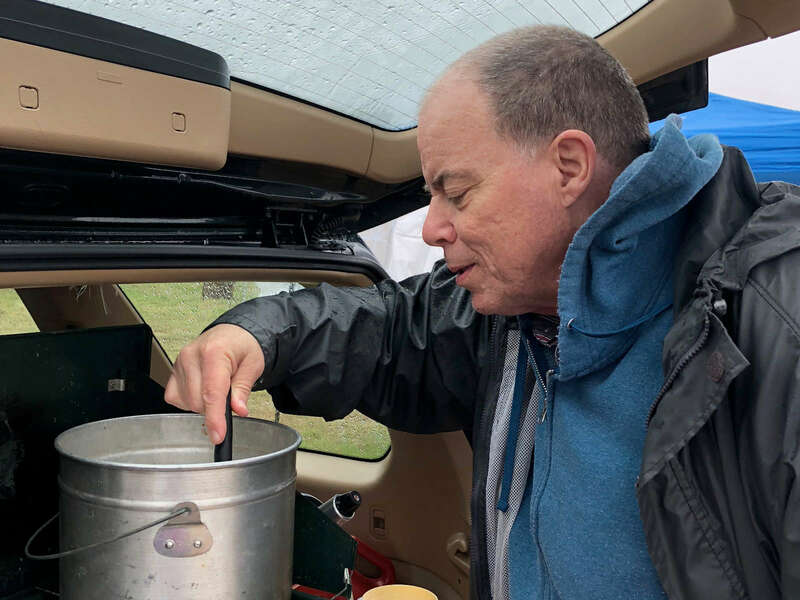 Gordon stirs some camp clam chowder that he and Karen made with their portable camp-cooking setup in the back of the Forester. 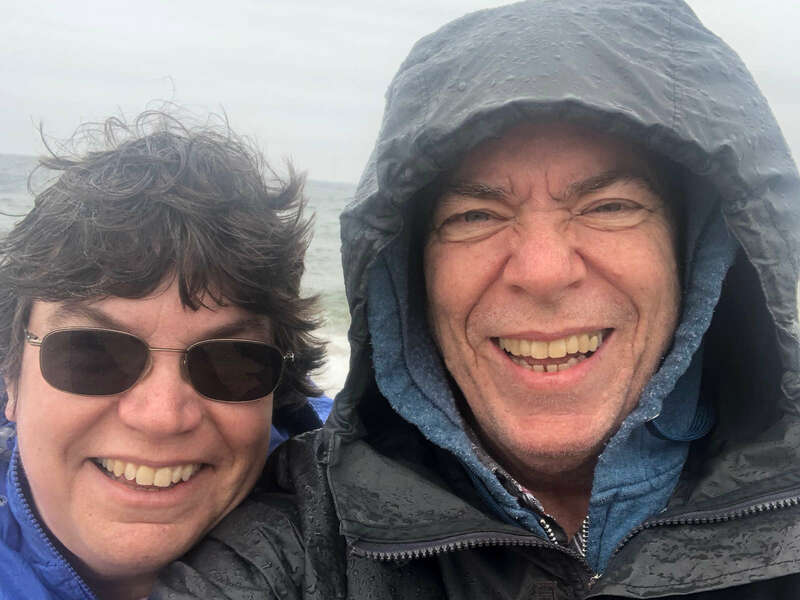 Karen and Gordon take a selfie in the rain at Salisbury State Beach. 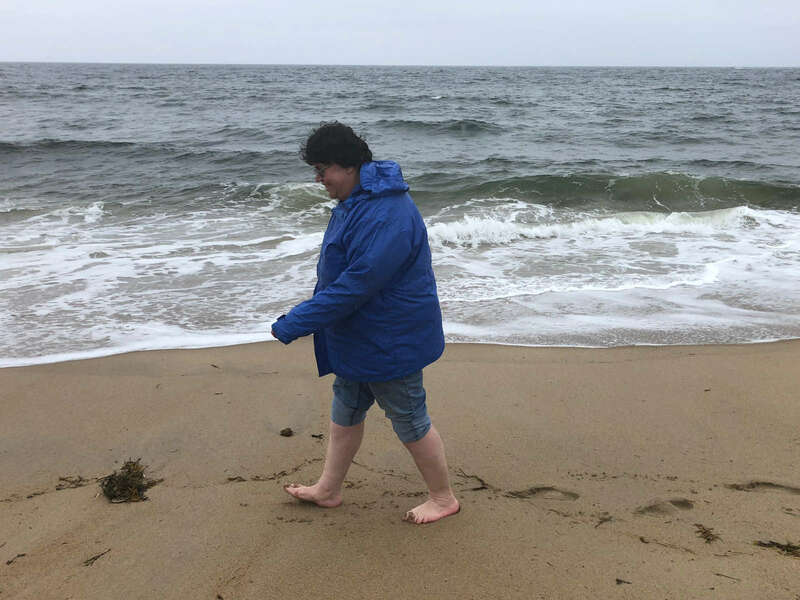 Karen takes on walk on the beach in Salisbury Massachusetts on a chilly and rainy May day. Thomas sitting in front of his computer screens. 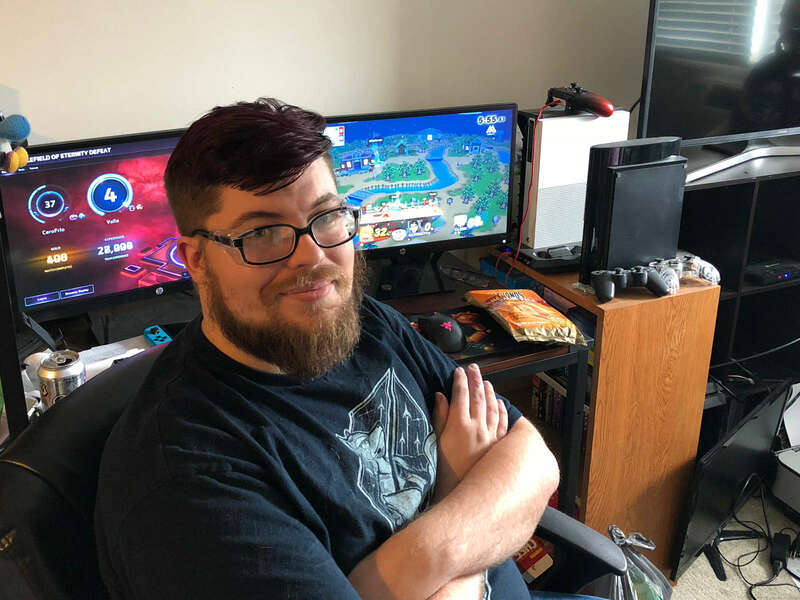 It's a little hard to tell in this picture, but Erin and Tammy (Tom and Erin's roommate) colored his hair dark purple recently. William William examining a slight defect in the paint of his car. That's right, his car, bought with his money, ready to take him to work when he gets his licene.